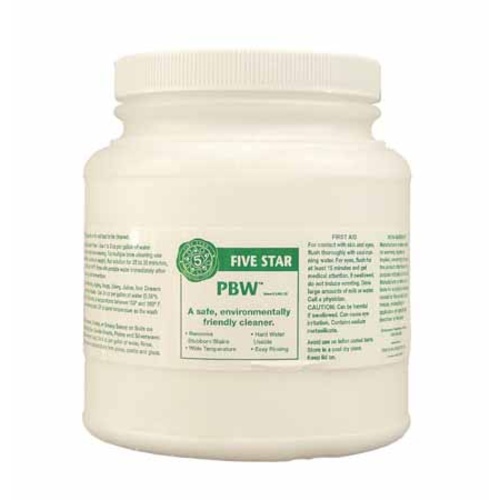 PBW (Powder Brewery Wash) is a safe alkaline cleaner for everything around your brewhouse. It’s a favorite of small home breweries because it out-performs caustic chemicals without scrubbing. Just put your kettle, bottles, carboy, etc. in for a good long soak. Even a better deal in bulk quantity. Comes in a bottle with a screw-top lid. We have been using oxi-clean free for all our cleaning needs for years; tried this at the recommendation of other brewers and I wish we had done this years ago! Oxi-clean is good for mild stains and general cleaning but PBW goes beyond and makes cleaning stains/burnt on crud a breeze! We rarely have to even scrub much anymore, instead just let them soak for a couple hours. Consistent and clean for everything around the brewhouse kettles to kegs. Get it and dont look back. I buy mine in 4lbs quantities. I have found this lasts for a long while since I only use about 3oz per 5 gallons of cleaner. I've even used this for laundry. Definitely worth the purchase that every home brewer needs. Remembers sanitizer only sanitizes and cleaners only clean. A must have for every brewery. Soak your kegs with 1 Tbls and 8" of hot water - shake, wait and rinse for sparkling clean results! Mix a batch of this and forget the scrubbing. A carboy full of warm water and PBW will be easily cleaned out after a short soak. I use this for carboys, kegs and bottles with no complaints. Best Cleaner for your brewery. Professional product! This is the best wash for your whole house. We use it everywhere. I've tried oxyclean and others-- I always come back to pbw! Get this cleaner, use this cleaner, enjoy this cleaner. Best investment you can make for your gear and your beer! This and Star-San are required for every brewer. Period. This is the best cleaner I have ever used on my home brewing equipment. No other info needed. Completely does what it should. I use this to clean all of my home-brewing equipment and have never had a infected batch. Highly recommended. You can't sanitize dirty gear! I frequently use just a single tablespoon of PBW to soak my dirty gear and the stuff works like magic! Use it on your brew equipment, use it on your pots and pans, use it on anything that need to get clean! PBW does all the cleaning work for you. I used to scrub with brushes, but that just caused problems by introducing scratches into the surface of what I was cleaning. Now I just soak dirty parts in a proper solution of this and let it sit (longest necessary was overnight, for really tough dirt). Easy. The 4lb tub is about right for the average brewer, IMHO. This is all I use. I love that it doesn't form the big chunks in the bottom of carboys when cleaning that are a pain to get out. I use it on metal, glass, and plastic. This stuff is like magic in a tub. Soaking makes scrubbing obsolete. Does a great job with lines/hoses, pumping through the system after brew day. Just awesome stuff. Love, love, love this stuff. Easy to clean out the pipes of my pilot system and know that they are clean. Fabulous on those kitchen pans with baked on crud as well. Makes cleaning up so much easier. I think it might just be impossible to enjoy homebrewing without this product. Must have. If your a home brewer you need to have this. I use this in conjunction with star San so I have peace of mind with clean equipment. PBW is the perfect cleaner for all brewing applications. My entire system getting a thorough cleaning after use, and anything that hasn't been used recently also gets cleaned before use. There is zero residue after using PBW (when used according to directions...read the directions). I even use it in the kitchen to clean my glassware...beer and wine glasses come out sparkling! I use this product to clean all of my brewing equipment. PBW will even soak the labels off of bottles with ease. About 30 minutes will do the job. You only need to attempt scrubbing a post-fermentation narrow neck glass carboy once to understand that homebrewing is a dangerous and expensive hobby. This product changes all of that. Add the powder (1oz/gallon) and soak whatever you would have scrubbed previously and leave it for a while, a half-hour or a couple hours, or even overnight. It will simply bubble away caked on organic solids and leave your equipment as clean as new. It's magic stuff and will save you hours of cleanup on every brew day. I use it for the most heavy-duty cleaning applications in my home brewery, from back-flushing tubing and soaking yeast out of a dirty carboy, to removing beer labels from recycled bottles. It works great, especially with warm water. As usual, when I purchased this product MoreBeer's shipped it out quickly & with no problems--I received it earlier than expected. I use this after brewing to clean out my kettle, pump, and heat exchanger and it works wonders. I save some hot water from my heat exchanger in a bucket and then add the PBW to it before dumping it back in the kettle to recirculate. It also works very well for cleaning out fermenters and kegs after they've been emptied. If you ever let something sit and dry, this is by far the best way to clean it out. If you're still using Oxi-Clean because you think it's cheaper, give this a try - you'll use less PBW than Oxi-Clean, which evens out the price, and it will get the job done faster and cleaner. Just mix this in with hot water and let it soak for about 30 min. Then hit it with the scrub brush a little and all the scum falls right off. Be sure to rinse with hot water thoroughly to get the PBW residue off. I love this stuff. Love it. Just let it soak and it comes out clean. I use it religously. PBW does exactly what it says it does it will remove organic material stuck to the side of your carboy, kettles, and your keg. Anything you want to get cleaned use PBW! Have used this product on conical fermentors, carboys, and kegs for over 10 years. Great product for the professional brewer and the amateur alike. The best cleanser on the market. Mix with water and let the cleaner do the work. All you need is a little patience. I have yet to meet something PBW can't take care of. Some complain about the expense, but trust us, it's worth it. In addition to brew day, I keep a smaller jar in the kitchen as well. There is nothing else I have ever found that can take off the baked on crud that gets onto my Pyrex bakeware and Chicago Metallic Bakeware - that stuff takes a little more vigorous scrubbing than the usual brewery cleaning. I love using this cleaner. Simple easy to make and has always performed off the charts for me. PBW is a really easy way to totally clean your carboys and other brewing equipment. I just add the appropriate amount of PBW to my carboy, fill with hot tap water, and let soak overnight. I've never had a problem with sanitation once I switched to PBW. This stuff cleans well. I soak my equipment in it and later I only need to wipe and rinse clean. This is a fantastic cleaner for everything in the home brewery: plastic, stainless, whatever. If something is particularly nasty, a good soak with PBW, and the filth comes off with ease. This is my stand by cleaner for my keezer, lines, hosing, kettles, pumps,fermenters and countles others. I even cleaned some grout in the bathroom with it. Worked really well and reduced my labor which is ALWAYS a good thing. Works really well and is always consistent. PWB truly is an amazing product. I use it for everything including pans that have baked on stains. Safe and effective, great cleaner! This handy stuff can be used to clean ALL your brewing equipment...without any real scrubbing at all....that's right...boil kettle, nasty carboys, empty kegs that have been in your garage for a couple weeks in the heat. You name it, this will clean it. Super easy and safe to use. Couldn't/wouldn't homebrew without it!! If you are sick of working your rear off to clean your kegs, bottles and the rest of your brewing stuff this is absolutely the way to go. I even pour it in the kitchen sink when I am done with using it for brewing. I then throw my regular dishes in it and then when I wake up in the morning all I have to do is rinse them with hot water and they are squeaky clean. Great cleaner, I haven't found anything yet that you can't clean up with a soak in warm PBW. I have been using this product since 2004 on my B3 1550 system. It looks brand new 10 years later. I recommend using this product. Bought a big 4 pound container and the lid came off during shipping and spilled all over the rest of my order and made a real mess. I contacted the gang at MoreBeer and they shipped out a new one fast at no charge (with tape on the lid this time). Great customer service, thanks. A little pricey, but worth it in the long run. No more brushing carboys. Works great. I'll start with cleaning my boil kettle and then put in large bucket for soaking bottles. Also works well on cleaning nasty stains on pots and pans. Yes, this stuff is a lot more expensive than dish soap but there is nothing easier to use. Add some PBW and water- clean brewing equipment will be waiting for you in the morning. It's worth the expense. I'd rather drink a home brew than spend time trying to clean out the inside of a carboy!! I use this every brew and the larger container is more economical.